A new video has been launched that shows a little bit more of how you will use the Microsoft Courier when it gets launched. The video is created by the same people who made the last MS Courier video and shows more details and a more realistic presentation on how a number of the features work. The previous video showed details on various features while the video below shows an overview of the interface and how features work. It seems like the main idea behind the courier is what Microsoft call an Infinite Journal that allows you to grab clips, images and text from your day to day browsing. 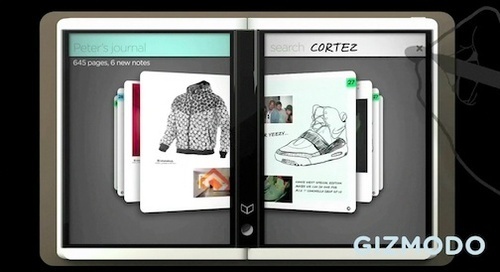 You store images and data in the infinite journal and then have the option of sharing various pages with others. Others can connect with their desktop, laptop or Courier device. The hinge in this video is shown as being a type of pocket that allows you to store captured images on it while you flick through your pages to find where you want to drop the image on to. Pen input seems to be the main factor of the book as you need to do some writing like note taking, searches by using handwriting. Maybe a virtual keyboard could be used too although the video doesn’t show this to be the case. Fingers are also seen to be used in the video with gesture based inputs like flicking through pages, opening menus and dragging various items. The dual screens appear to work as a multi-screen setup with data being dragged from one screen to another showing it as one continuous screen, while each side also has it’s own specific purpose in some cases. Although media isn’t seen on the device, it wouldn’t surprise me that you could watch a movie across 1 or 2 screens, listen to music and do a number of things you expect a tablet/booklet style device to do. Other details I have just read say that the Courier will run Windows 7 and the OneNote style interface will be installed. Other applications as far as I have read, wont be able to be installed. Also, it seems like Microsoft are building the hardware themselves (like the XBox 360) if it leaves the incubation process (which is a step after the research projects) and they hope to get it ready for mid 2010.